Moving to Melbourne from London five years ago, one of the things I found hardest to adjust to was the lack of British High Street. 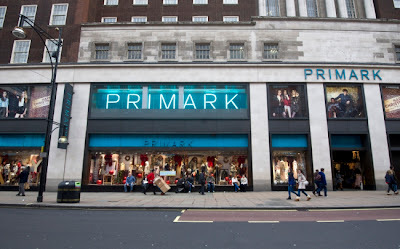 The idea of shopping without any of the shops I loved and was used to, such as Topshop, H&M and of course Primark was one that filled me with dread. Alright, not dread exactly - I could never feel that way about shopping! - but it certainly posed some challenges. When you're familiar with a place, you know exactly where you need to go for certain items. If I needed new underwear, M&S was the place to go. Jewellery at a price that wouldn't break the bank? H&M was your (wo)man. Cheap anything? 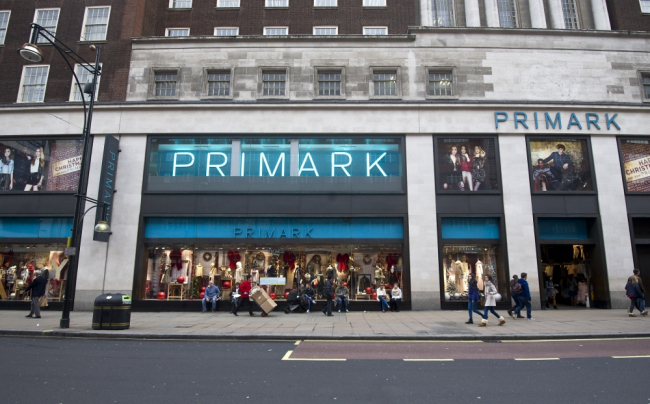 Primark. It took a while and a few (expensive) mistakes to figure out my equivalents here in Australia. Topshop is a shop I've always loved, due to its fun and stylish designs, incredible designer collaborations and obviously clever branding and marketing. One thing we haven't always agreed on however, are the prices. For me, Topshop was always the place for a treat - yes, the items were gorgeous but you were paying quite a lot for them. A good day at Topshop Chapel Street! Probably because I'm no longer 13, and maybe because I've become accustomed to Australian prices (where I feel like its harder ((but not impossible!)) 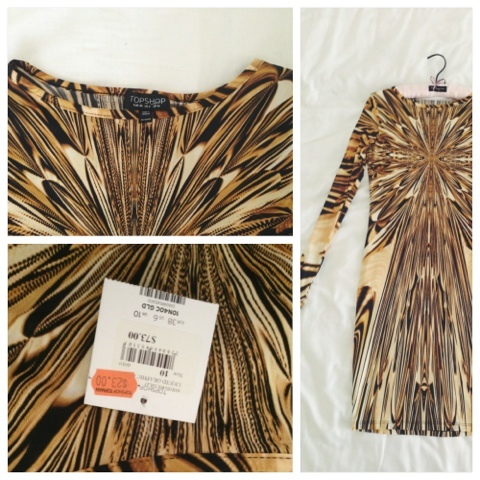 to get good quality fashion items for lower prices a la H&M/Primark), Topshop now seems a lot more reasonable. And when they have a sale on... Well, you don't argue with reason, people. And so I found myself in the crazy crowd of Topshop sale goers last week. Racks upon racks of discounted clothes greeted me as I stepped through the doors, so the only thing to do was roll up my sleeves and dive in. I was surprised at how heavily discounted many good items were and as a result it was hard to stop myself just grabbing everything in sight. Luckily Mum was there to restrain me. I tried on a few things, including the athletic 'GEEK' t-shirts that everyone has and I've been wanting for a while. Unfortunately they only had it in the crop version which I felt going into WINTER might be a tad limiting.. Anyway, I felt with two holographic cat bags (whaaat!?) filled with goodies, which in addition to the knowledge that i'd made myself some good savings, makes it a very good trip in my mind! This would have to be my favourite buy of the day. There was just one left on the rack which I made a quick beeline for, ready to elbow anyone who got in my way. 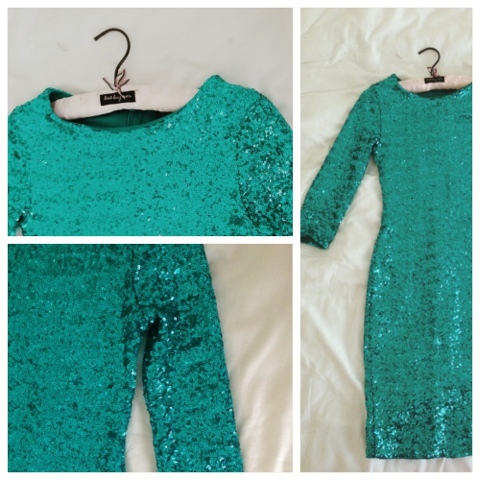 It's a gorgeous turquoise sequinned figure- hugging 'disco' dress. It's quite long, probably just above the knee, which I think makes it a lot classier than if it only just covered my bum. 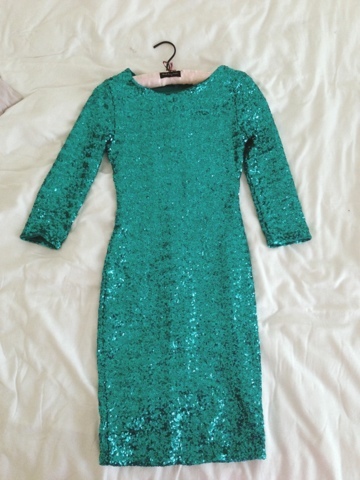 As well as being sparkly and my favourite colour at the moment, it was also massively reduced - $65 down from $131. I couldn't wait to wear it, so ended up taking it for a spin that night for drinks with friends. Now I think this was actually spotted by Mum (giving credit where it's due!) but as soon as she showed it to me I was sold. 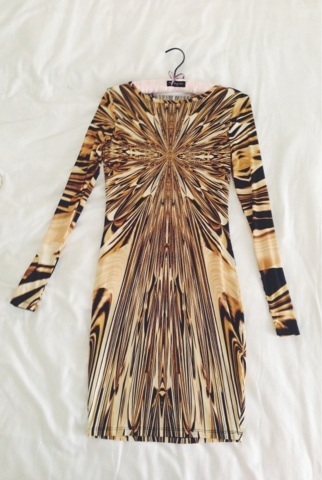 The design is striking and reminds me of liquid gold, and the material is gorgeously silky. Again this one is also longer, but I think it looks better shortened so thats probably how I'll wear it. Made some massive savings on this one too - $23 down from $73! 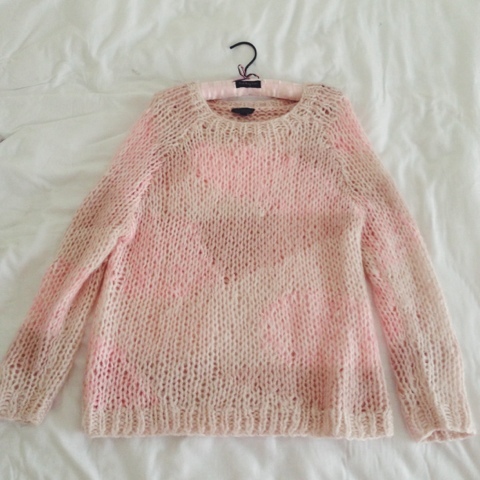 This was perhaps my most practical buy - a pinky/brown knitted jumper. Close up you can't really see the geometric pattern but I think it's quite playful. 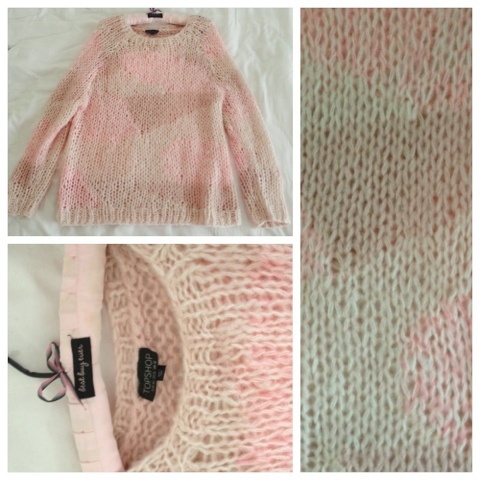 It's extremely cosy and I quite like that it's more pastel colours - it will look great with some very blue jeans and boots for winter. Another great save - $26 down from $86. So as I've confessed in previous blog posts, this year I've become a serial nail varnish buyer and now have quite the collection going. I've been hunting for a Tiffany coloured blue nail varnish for a while now, so I was extremely excited to finally spot it in Topshop. I also couldn't walk passed the galactic purple, so that ended up in the basket too. I think they were about $12 each, which is a bit above average for nail varnish, but i'd fallen in love with the colours. Having never tried Topshop nail varnish, I was initially rather disappointed with the quality. I decided to paint my nails 5 minutes before I was due out (silly idea I know!) so only had time to do one quick coat. The consistency was watery and the colours very pale. The following day, I tried a few more coats and was much happier with the colour (as seen in the picture - excuse the chips!). The turquoise is slightly more green than i'd hoped but I love the purple. 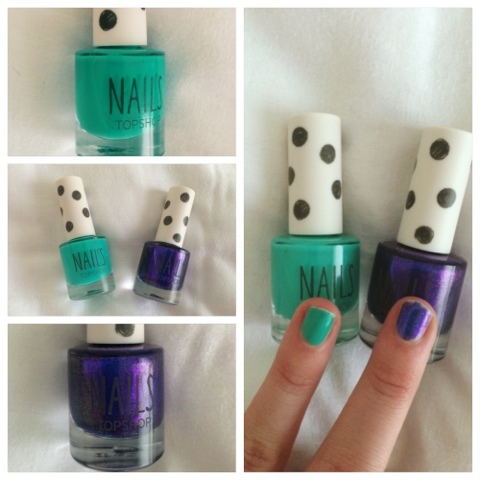 What do you reckon of the quality of Topshop nail varnish/make up collections? Taking my disco dress out for a spin! With loads of stores now having their end of financial year sales, it's definitely time to hit the shops! It's a great opportunity to pick up things you've been eyeing up for a while with big discounts, or just treat yourself to a few indulgences. What do you reckon of my bargains? Would love to hear what new items you're loving at the moment in the comments below!